Over the last few months, Sonoma Nail Art has become the Holy Grail of my wishlist. An insanely talented nail artist and blogger, Michelle creates polishes with an artist's eye for colour, polishes that squelch and ooze with creativity and texture, and which I can never ever seem to manage to get my hands on !! Well, thanks to my lovely friend Emma, I finally own some!!! Huzzah !! And today is the first of the 3 Halloweenies I have to show you. Suffice to say, NONE of them disappoint, and at least 2 of them are vying for my Ultimate Halloweenie Winner Crown. I was quite shocked that I wanted Here Lies Robert, after all, it's got green in it. Worse, the green is HAIRY GLITTER, my absolute number 1 urgh factor in a polish, but there is just something so effortlessly cool about how all the elements of this polish combine together. 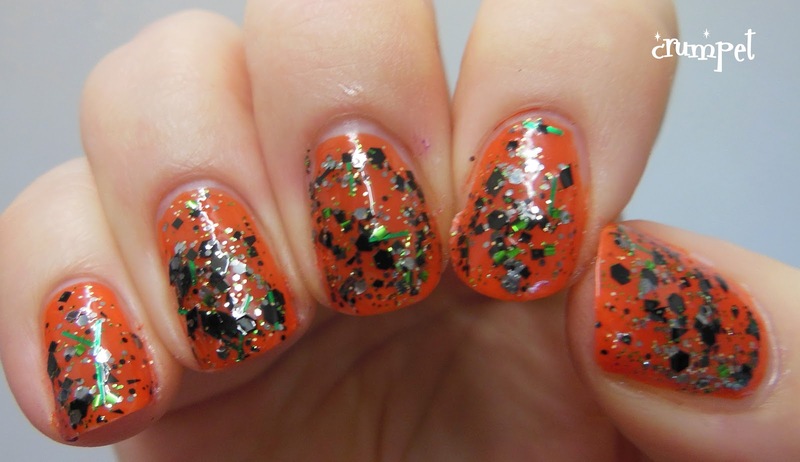 Essentially this is a black metallic polish, random in composition, and then sprinkled with green. It's exactly what you would get if you took a piece of a tombstone, blitzed it, and then added some grass from the grave - it's a cemetery in a bottle. 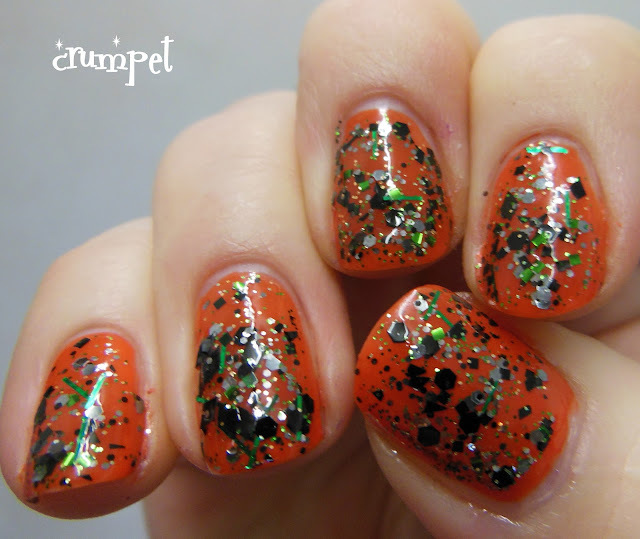 Because it's Halloween, I layered this over Barry M Block Orange, and I love the contrast. Most of all, I love the randomness of the glitter, and they way it glitters *darkly*, like Death's own reflection.